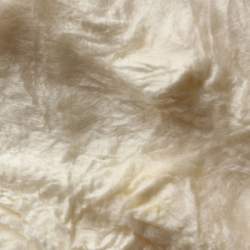 Once the gum has been removed from the silk cocoon it's spread on a frame to form a hankie or square shape. More than one cocoon is spread on each frame so hankies have more than one layer and may be peeled apart before use. It's possible to spin directly from the silk hankie or to incorporate it into your felt making and as it's silk it may be dyed with either fibre reactive, acid or natural dyes.